All roads lead to Catigbian as it becomes not just mecca because it would be spreading the banqueting table for the feastday of the Immaculate Conception Saturday December 8. It would be so, for several more profound reasons. From being just another ordinary town saddled with the political and social baggage, Catigbian has streamlined itself to be one of the fastest sailing towns and for Mayor Roberto Salinas, this should be one big reason enough for a grand celebration. And for the rest of the Catigbianons, this Saturday, they shall again light their candles of devotion as they lay the banqueting table of thanksgiving for the Lady of the Immaculate Conception. The Feastday has also become an apt cap for a town that has reaped enough laurels for the year, and Mayor Salinas with Vice mayor Necita Digaum are certain its worth a celebration. Both pointed out that when Catigbian plotted the course and made the right decision, it was just a short time after it pegged itself as a name synonymous to innovation in governance. And it also became quite a name to reckon with. To cite a few astounding achievements, Catigbian bagged the regional Pamilihang Bayan award as the third best market in the Visayas. The accolade would even pale in comparison to the millions that the market has generated in revenues, one which enables the town to gain greater spending power for its programs, Municipal Information Officer Ardissa Estavilla shared. Change in Catigbian came two ways, an abrupt change in landscape and a rather subliminal change of heart of the people. While on his first few days in his Administration, Salinas admitted it was hard to plot a course for an unknown agricultural town barely subsisting from its own produce with people so hopelessly tied to their farms. Then, the idea was even complicated by the fact that the town earned the taunt as an insurgency haven more than a struggling agricultural town. â€œIt was a decision we made after having consulted the Catigbian management teamâ€, recalls the retired navy captin who ventures into a practically unknown water of politics. But with everyone attuned and committed to the vision for the town, everybody hoisted the sails and rowed if the need comes, he said his analogy. Catigbian adopted battlecry smile for sports and youth development, mobility and communications, infrastructure, livelihood and environment protection for the administrationâ€™s priority projects. Streamlining his most powerful tool, the town focused on its market and implemented reforms in the market, one which was not just physical, he said. When Catigbain public market won the Visayasâ€™ third best market, it was something the local consumers took their pride in. And the learners eager to know the way started coming. The livestock auction market even enriched the townâ€™s physical landscape and when Catigbian opened the biggest livestock auction market, things moved in leaps and bounds. What the town has generated in the auctionâ€™s opening day leveled of the sum revenues the old town auction market has bagged in years, records from the Municipal Treasurer shows. Apart from effectively linking with international funding agencies to finance their priority programs and the national government for its project funds, local leaders have also prepared countefrpart amounts to leverage other funding sources. This year alone, we were able to put up the twin gazebos in front of the town hall, one which affords the commuters comfort while awaiting for their rides. We have also put up a new municipal health center with five beds lying in capacity, paid for the land and leveling of out Municipal Materials Recovery Facility, opened a farm to market access road from a proposed tourism showcase and hit the rehabilitation of a crucial FMR to barangay Causwagan from poblacion to Alegria, Estavilla added. If Catigbian has become a learning mecca, what does it teach? For Mayor Salinas, it is all about reining the full immensity of power at their disposal, especially when everybody is attuned to achieving a purpose. â€œI have always been consistent in telling my people: Unity and cooperation is the key to progress and development,â€ Mayor Salinas stressed. Next to that, when you have a full team committed to make things work, everything falls into place, he said. And indeed, it has shown wonders when the town of Catigbian has become one of the most progressive towns, cites League of Municipalities of the Philippines president and Jagna Mayor Exuperio Lloren. This next front-line team, to make sure that they start right, Catigbian opens the year with the joint oath-taking ceremonies done November 9. The day was also exactly the first day of the novenario. What has been purely thought of as a political activity, in Catigbian, it was done inside the Immaculada Concepcion Church with Mayor Salinas, Judge Jorge Cabalit and National youth Commissioner Benjie Oliva as inducting officers. â€œIts something when you swear your service to God and men, more aptly in a church with God as a witness rather than have it anywhere elseâ€, Mayor Salinas admitted. The rest is history and the fact is, Catigbian has become an inspiration of fine governance for adhering to such a true, tested and valued motto. What has been earlier touted as the haven of insurgents has now become a learning center for local government units willing to go their way and eager to replicate the top programs that made Catigbian an interesting dot on a map. The town has so far committed to go by that rule of thumb of unity and cooperation and for retired navy captain, Catigbian has set its course. Now to the poser: will Catigbian succeed and reap the same if not more profound lessons in investing in people, the thanksgiving next year may be a yardstick. Oy.......gusto lagi ko makaanha Bro... Layo ba na?..karon pa man ko kadungog anang Catigbian.. ..Oh no! Duol sa Balilihan, Sis. Labay lang pud ko ani nga town. Maayo unta ug naa ka inig uli nako Bro kay mangadto ta...hahaha saon dili man ta mag-abot oy.Anhi na lang sa Japan Bro,aron dire na lang ta manuroy.. 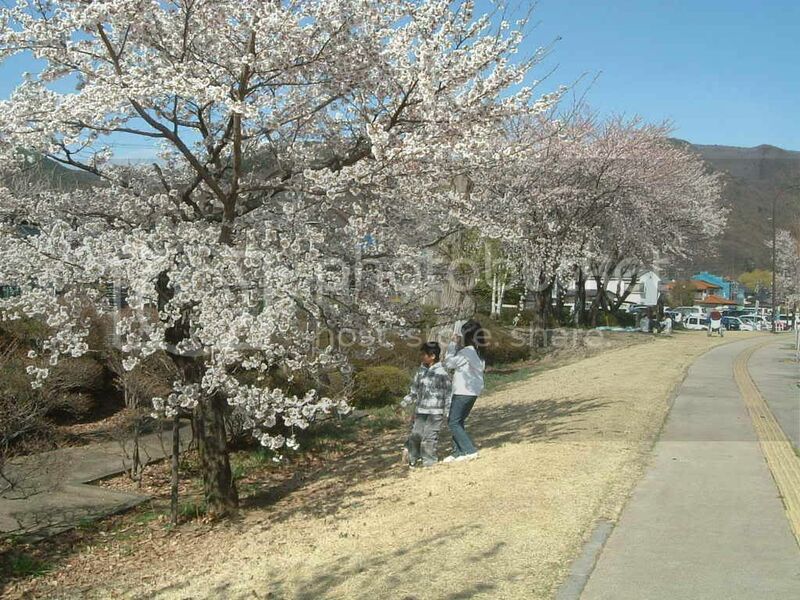 I wish to see the Cherry Blossoms in Japan, Sis. Every April bro. naa ra sa among kilid-kilid...duol ra jod...mura ra kaduol sa balay sa imong Lola paingon sa balay ila Nong Dominggo..unya kana nga dalan taas jod na kaayo nga puro cherry ang imong agi-an. Beautiful picture, Sis. I would be writing poems under the cherry trees. I was looking for the other cherry blossom pics pero natabunan na...mas nice unta tong naa lang sa duol sa among balay..Oo bro. it's a good place to write poems under the cherry trees..And since it is spring time,you'll love the temperature and the good scent of the air.how I love spring time! Hmm. Kanang baktin nga gidihogan og mantika? Kanay tinuod nga makalingaw! Daghan gihapon ug mga native products diha. Catigbian, the town known for its delicious dishes! I stopped by a cantina there one time. They prepared a really succulent dish of Pinakbet.